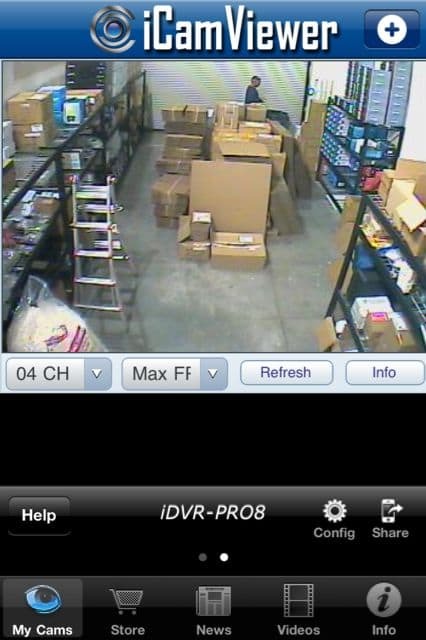 iCamViewer from CCTV Camera Pros is a free app that allows you to view up to 8 IP security cameras from your iPhone. 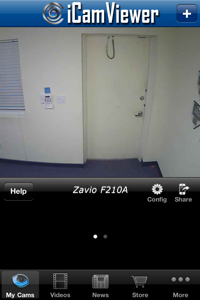 This app works with both IP cameras and CCTV cameras with compatible Zavio and Vivotek video servers. CCTV Camera Pros today launched a new version of the iCamViewer iPhone app for viewing CCTV cameras and IP cameras. The new version of the app supports viewing 16 IP cameras or 16 iDVR surveillance DVRs. Users can also mix IP cameras and multiple iDVR-PRO DVRs. The previous version of the app only supported remote viewing of 8 devices. Another improvement is that the previsou version used up all 8 supported devices if the user want to view one 8 channel iDVR-PRO8 DVR. The new app version only uses one channel per DVR and the user can switch to different cameras in the single DVR view. This means that users can configure up to 16 iDVR-PRO8 or iDVRPRO16 model CCTV DVRs in the app (up to 256 cameras when using 16 iDVR-PRO16 models). To setup the an iDVR-PRO8 or iDVR-PRO16 CCTV DVR to be accessible from the iCamViewer, users can follow these instructions. Configure port forwarding on your router so that your DVR can be accessed from outside of your local network. If you need help with this step, please refer to this page for port forwarding instructions. It is recommend that you test the Internet access from the safari web browser in your iPhone to confirm that port forwarding and the connection is working properly before configuring the iCamViewer app. After you confirm that the connectivity is setup correctly through Safari, download the iCamViewer app from iTunes. Open the app on your iPhone, iPod touch, or iPad device and click on the Config button in the My Cams section of the app. Name: This is any name you want for your camera. Host or IP: This is the public (not LAN) IP address where your iDVR-PRO is located. If you are using a DynDNS service, you can enter the hostname here. The below screenshots show the iCamViewer app being used to access an iDVR-PRO8. 4 CCTV cameras are connected to this particular DVR. The user is able to click the DVR Channel select wheel to switch to the 4 different cameras connected to this DVR. The user can swip his finger across the screen to access other DVRs or IP cameras if additional devices are configured. Please click on any of the below images to access a larger image view. CCTV Camera Pros would like to thanks our partners at AppBurst for the awesome mobile application development services that they have provided in co-developing the iCamViewer with us. In addition to developing great mobile applications for surveillance, they also have one of the best development platforms to develop iPhone and iPad apps for events and conferences. CCTV Camera Pros is a supplier of security cameras and video surveillance systems for home, business and government use. We are a veteran owned business founded by a United States Marine and are located in Palm Beach, Florida. CCTV Camera Pros can assist in the design of surveillance systems for any size application. Please visit CCTV Camera Pros website to learn more about us and the products we supply: www.cctvcamerapros.com. 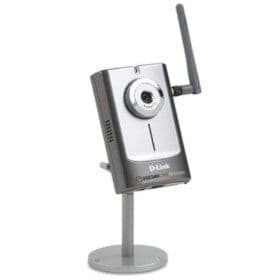 CCTV Camera Pros has integrated the following D-Link IP cameras into the free iCamViewer iPhone app which is used to view live video of security cameras from the iPhone and iPad. Please note that PTZ camera models do not yet support pan tilt zoom control at this time. 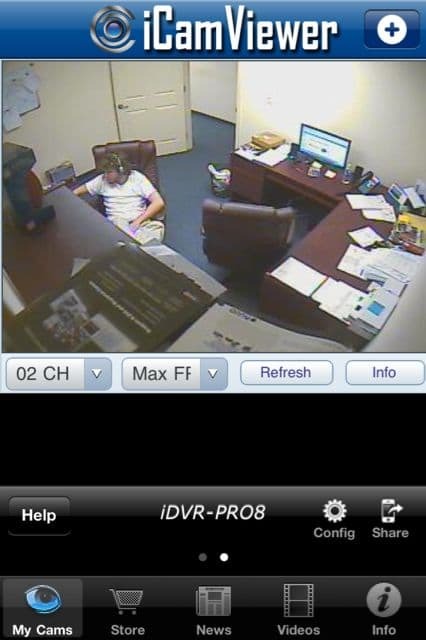 The following image was captured while the iCamViewer app was viewing a DCS-6620G IP camera. Please click on the image for a larger view. 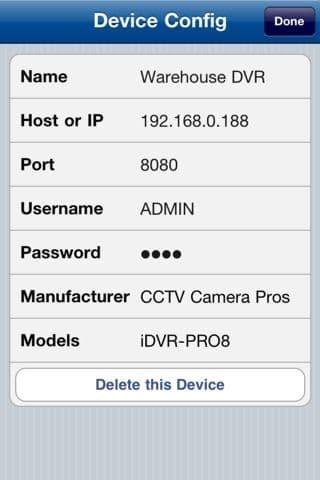 iCamViewer from CCTV Camera Pros is a free iPhone and iPad app that allows you to view up to IP security cameras and CCTV cameras from your iPhone. iCamViewer is compatible with IP camera manufacturers such as Vivotek, Zavio, Axis, D-Link, LinkSys, Cisco, Mobotix, and StarDot. 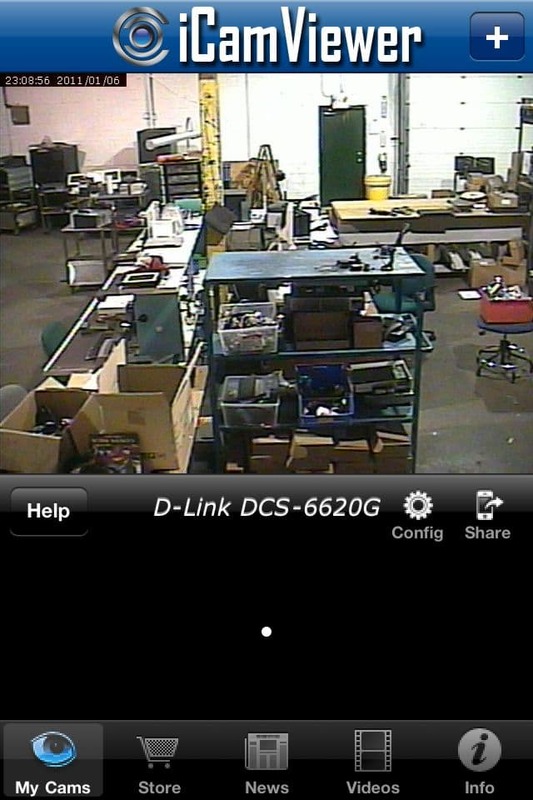 The iCamViewer app also works with CCTV cameras when used with a compatible network videos server. 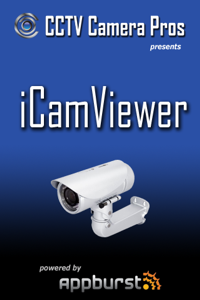 Click here for more information and to download the iCamViewer IP camera iPhone app for free. CCTV Camera Pros is a supplier of security camera systems for home, business, and government use. CCTV Camera Pros is a veteran owned business and GSA contract holder. CCTV Camera Pros has a complete line of video surveillance products including security cameras, digital video recorders, monitors, cables, connectors, and all accessories needed for a complete video surveillance systems. CCTV Camera Pros can help design systems for any type and size application. Please visit www.cctvcamerapros.com to learn more. CCTV Camera Pros is proud to announce that Mobotix megapixel IP cameras are now compatible with the iCamViewer, a free iPad and iPhone app for viewing IP cameras. The iCamViewer app allows users to view multiple Mobotix megapixel cameras and also allows users to view a mix of CCTV cameras, megapixel IP cameras and non-megapixel IP cameras from a single application. For users to be able to view analog CCTV cameras, the CCTV cameras must be connected to a compatible CCTV DVR or network video server. In addition to Mobotix IP cameras, the iCamViewer also supports viewing Axis, Zavio, and Vivotek network cameras. CCTV Camera Pros will be adding additional network IP camera manufacturer camera models often. 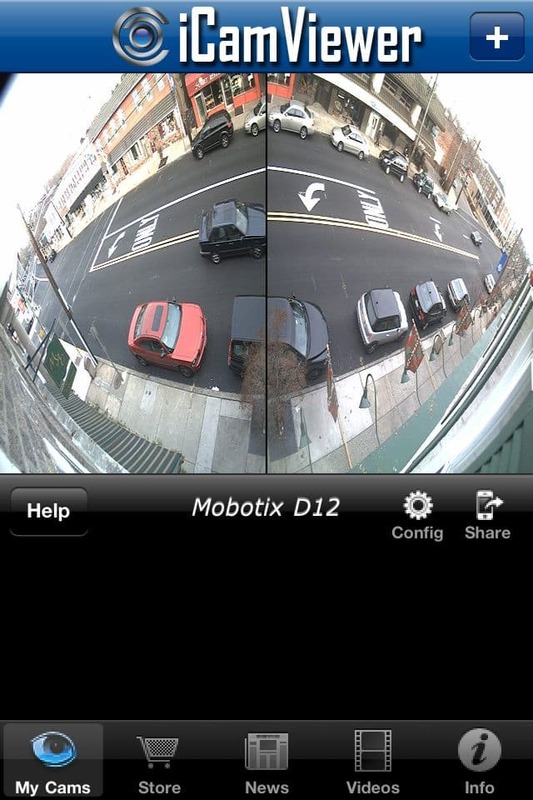 The iCamViewer has been tested with the Mobotix model D12 camera. Being that Mobotix cameras all use a standard interface and software development kit (SDK), the iCamViewer should work with all Mobotix camera models. Users should make sure that the JPEG image URL is enabled for their camera if they are having trouble with the app. Users that need help can email support at icamviewer@cctvcamerapros.net. 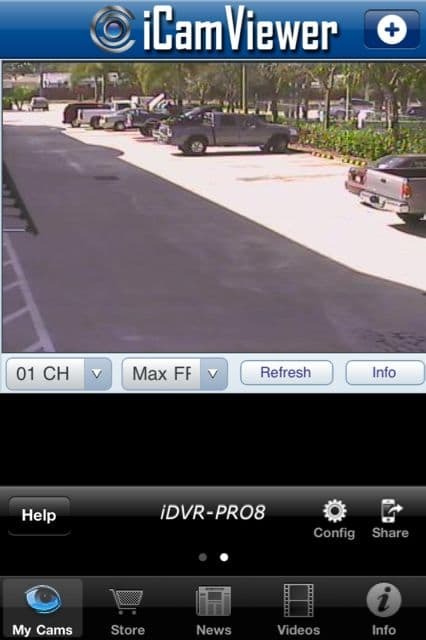 Below is a screenshot that was taken when CCTV Camera Pros tested integration with the Mobotix D12. Click here to download iCamViewer, the free security camera viewer app. CCTV Camera Pros is a global supplier of security camera systems for home, business, and government use. CCTV Camera Pros is a veteran owned business and GSA contract holder. 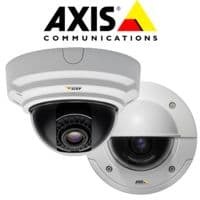 CCTV Camera Pros has a complete line of surveillance products including security cameras, digital video recorders, monitors, cables, connectors, and all accessories needed for a complete video surveillance systems. CCTV Camera Pros can help design systems for any type and size application. Please visit www.cctvcamerapros.com to learn more. CCTV Camera Pros announced today that the latest version of the iCamViewer, an iPhone app for viewing CCTV cameras and IP cameras, is now compatible with the iDVR PRO line of CCTV surveillance DVRs. Using the iCamViewer app, users can not configure CCTV cameras that are connected to their iDVR-PRO to be viewed remotely over the Internet from their iPhone or iPad. The iDVR-PRO already accessible from the Safari web browser from iPhones, however it was not very convenient for users to always have to type in the URL of their DVR and enter their login information. Now, users can save their DVR and camera settings in the iCamViewer app and just launch the app when they want to view their cameras. To setup the an iDVR-PRO recorder to be accessible from the iCamViewer, users can follow these instructions. After you confirm that the connectivity is setup correctly through Safari, download the iCamViewer app from the app store. Open the app on your iPhone or iPad and click on the Config button in the My Cams section of the app. In addition to supporting the iDVR PRO, the iCamViewer is also compatible with CCTV cameras by using a compatible network IP server or CCTV Camera Pros iDVR-PRO CCTV DVR. CCTV Camera Pros is a manufacturer and distributor of video surveillance equipment for home, business and government use. CCTV Camera Pros is a veteran owned business founded by a United States Marine. 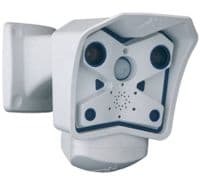 CCTV Camera Pros has a complete line of surveillance products including security cameras, digital video recorders, monitors, cables, connectors, and all accessories needed for a complete video surveillance systems. CCTV Camera Pros can help design systems for any size application. CCTV Camera Pros is partnered with a network of over 600 installers in the United States to provide surveillance system installation to all areas of the USA. Please visit CCTV Camera Pros website to learn more about us and the products that we supply. 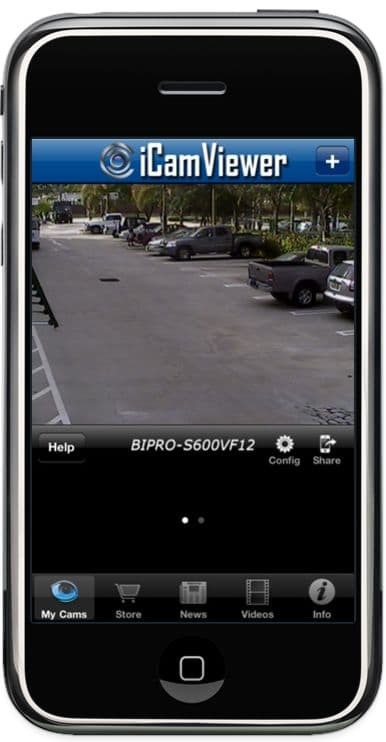 January 25, 2010 – Palm Beach, Florida – CCTV Camera Pros of Boynton Beach Florida, a manufacturer and distributor video surveillance equipment, has announced that a new version the iCamViewer surveillance iPhone app has been released into the app store and now supports Vivotek IP cameras (7000 series). SD7151, IP71x7, IP7131, IP7132, IP7133, IP7134, IP7135, IP7137, IP7138, IP7139, IP7142, IP7151, IP7152, IP7161, IP7251, IP7330, IZ7151, PT7000, PZ7111, PZ7151, PT7135, PT7137, PZ7152, PZ7111, PZ7151, VS7100 IP video server. * Note that PTZ controls are not yet supported within the app. CCTV Camera Pros is a manufacturer and distributor of security cameras, videos surveillance systems, and CCTV equipment. We are a veteran owned small business founded by a United States Marine. CCTV Camera Pros specializes in the design of reliable and scalable video surveillance systems for homes, businesses of all sizes, and local and federal government agencies. CCTV Camera Pros has a complete portfolio of products including, security cameras, digital video recorders, monitors, cables, connectors, and all accessories needed for a complete surveillance system solution. CCTV Camera Pros is partnered with a network of over 400 installers in the United States to provide surveillance system installation to all areas of the USA. Visit www.cctvcamerapros.com. VIVOTEK offers a comprehensive product lineup, including network cameras, video servers, video receivers, NVR, and central management software. In 2005 VIVOTEK launched the first self-developed multimedia SoC (VVTK-1000), and used it in its 7000-series surveillance products. For years to come, VIVOTEK will develop products featuring more advanced functions to broaden our product portfolio from entry level to high end. VIVOTEK will also continue to offer more cost-effective and higher value-added solutions for our customers. VIVOTEK’s core competence lies in its strong R&D capability. Throughout the years, its R&D strength has been demonstrated by the development of video codec technology, networking protocol, and multimedia SoC, building up solid knowledge and experiences in developing reliable products in a challenging network environment. Visit www.vivotek.com. CCTV Camera Pros has released the iCamViewer iPhone app which is available in Apple’s app store for free. The purpose of the app is to allow customers to view live video from up to 8 CCTV or IP cameras remotely using their Apple iPhones or iPod touch devices. In addition to being able to view security cameras from the iCamViewer app, customers can also keep informed by being able to read articles and watch videos related to CCTV Camera Pros products and the video surveillance industry in general. Users who download the app who do not yet have any security cameras can browse the list of compatible cameras within the app’s store module or to see a list of iCamViewer compatible cameras now, please visit this page: iCamViewer compatible cameras.. For users that have existing CCTV cameras and surveillance systems, CCTV Camera Pros supplies a number of video servers that allow existing and legacy CCTV cameras work over the Internet with the iCamViewer app also. Click here to download iCamViewer from iTunes. For questions or comments related to the iCamViewer, please contact CCTV Camera Pros at 888-849-2288. What an excellent app. I hope there are more supported cameras in the future. CCTV Camera Pros is a direct supplier of video surveillance systems & security cameras. 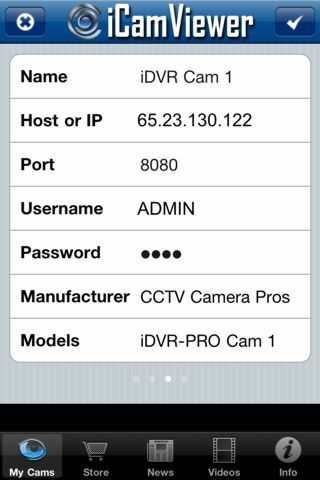 © 2010 iCamViewer iPhone App for CCTV and IP Cameras All right reserved.